History | Kenhorst Fire Co.
Back in 1931 a group of citizens of the Borough of Kenhorst held a meeting at the home of Frank R. Kreisher, 1000 New Holland Road. On this date it was agreed to organize a fire company for this new and progressive borough in Berks County. On November 29, 1931 the first permanent organization was formed with these officers: Paul H. Lykens, President; Clarence R. Searfoss, Vice President; John J. Ruth, Recording Secretary; Frank R. Kreisher, Treasurer; William Kreisher, Claude E. Briner and Claude Sticter Trustee. On February 6, 1932 the company was granted its charter with 208 charter members. The Fire Company purchased the Schlegel Building on Kenhorst Boulevard for its headquarters in 1932. In 1947 a $75,000 remodeling program was started. Since that time many improvements have been made. These include the installation of four bowling alleys, paved parking lot, the remodeling of both the ballroom and barroom and improvements to the exterior of the firehouse. The Fire Company has had a total of 12 fire apparatus during its 77-year history. The first was a used piece of equipment purchased from the Bally Fire Company. The next was a pumper from Buffalo Fire Appliance Company in 1934 (This piece is still in operating condition and is used in parades). The third apparatus was purchased from the Peter Persch Company in 1958. 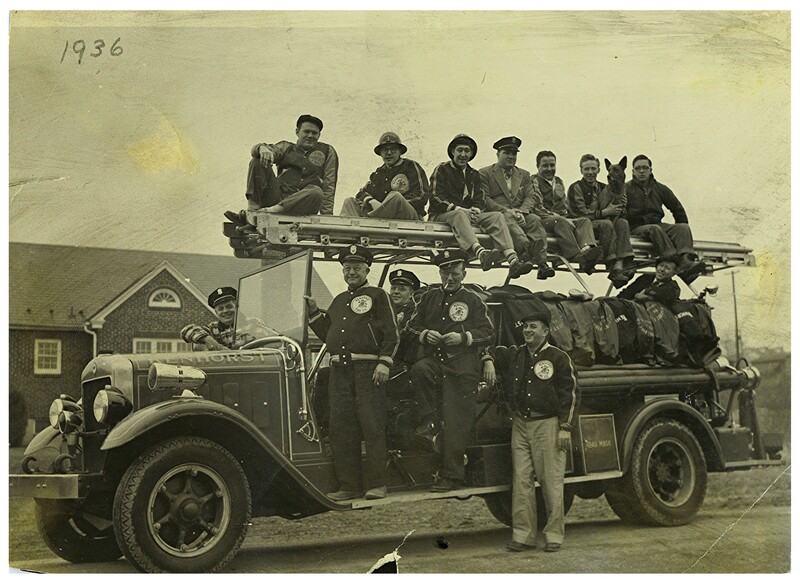 The fourth piece of apparatus was a 1941 Mack Pumper purchased in 1973 from the City of Reading to replace the Buffalo when it fell victim of old age. In April of 1977 a 1000-gallon per minute pumper was purchased from the Pierce Manufacturing Corporation that was housed in the 45th anniversary parade and housing ceremony on June 11, 1977. In September of 1980 a 400-gallon per minute mini-pumper was purchased from Pierce Manufacturing Corporation to replace the 1958 Peter Persch. This truck was housed in the 50th Anniversary parade on May 22, 1982. In 1983 due to the increased equipment needed to be carried, the Fire Company looked to purchase a utility truck. In that year Bell Telephone sold the Fire Company a used truck for one dollar, which was transformed into a utility truck by the members of the Fire Department. In 1987 a GMC Utility Truck was purchased to replace the 1983 utility truck. This truck was bought as an empty shell and the members of the Fire Department built the rest. In 1989 a 1250-gallon per minute pumper was purchased from Hahn Manufacturing Corporation to replace the 1977 Pierce. Both the Hahn and the GMC were housed on May 6, 1989. In 1994 a 1250-gallon per minute pumper was purchased from Four Guys, Inc to replace the 1980 Pierce. In 1999 the fire company purchased two houses located next door for the purpose of expanding our parking area. The houses were torned down and a 21 space parking lot was added. In August 1997 the membership voted to spend approximately $200,000.00 to remove the bowling alleys and put in a new kitchen, dining area, bathrooms, an office and central air conditioning. The kitchen is currently used for weekend meals, breakfast and Monday night wings. In 2001 a Utility/Rescue Truck was purchased from Emergency Vehicles, Inc. This apparatus replaced the 1987 GMC Utility Truck. In May 2006 the fire company signed a contract to purchase a 2007 KME 1250 GPM pumper to replace the 1988 Hahn. This apparatus was delivered in June 2007 and put in service in August 2007. The Firehouse we currently occupy was built in 1973 and occupied since December of that year. This building is capable of housing three trucks and is used for training purposes and various fund raising functions conducted by the Fire Company. It also contains a meeting room and office.